Choose from an endless selection of interesting and fun things to do in Manchester. Some popular landmarks to see include the John Rylands Library which is a neo-Gothic building with amazing architecture. 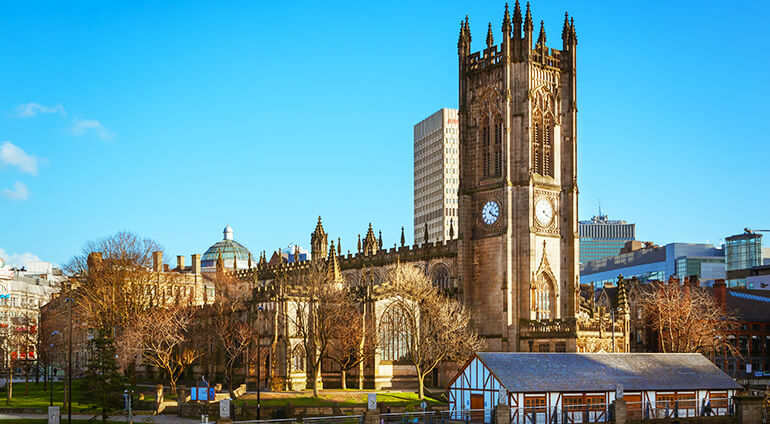 There’s also Manchester Cathedral and the Manchester wheel which offers fantastic views of the city. As well as visiting both football stadiums, football fans might want to drop by the National Football museum which has over 140,000 items. Kids will enjoy spending the day at Chester Zoo, which has all sorts of different animals including rhinos and elephants. Manchester also has excellent shopping and is one of the best places in the UK to go shopping. There’s high street brands on Market Street, the Trafford centre and the Arndale Centre. Exchange Square is home to stores such as Harvey Nichols and Selfridges and for upscale designer shops head to King Street. Manchester also has a Chinatown, the third largest in Europe. Other neighbourhoods you might want to check out include Castlefield, Gay Village and the Northern Quarter. Those who want to get out of the bustling city for a moment should visit Heaton Park, a 600 acre park in the grounds of a Grade I listed 18th century house. Other must visit attractions in Manchester include The Lowry which is an arts and performance centre and the beautiful Victoria Baths.